Pleurisy is an inflammation of the pleura covering the light, the inside of the chest, aperture and mediastinal organs. Pleurisy is dry and exudative. Dry pleurisy is an inflammation of the pleura with education on it the minimum amount of liquid. Patients feel a sharp stitching, aggravated by deep breath and cough. There is a General weakness, the body temperature rises to 38 degrees, the respiration is weakened. Exudative pleurisy is an inflammation of the pleura with vpotevanie in the pleural cavity (often in the top-side areas of the chest) liquid exudate, which puts pressure on nearby organs (heart, diaphragm, liver), limits excursions chest, shifts the diaphragm down and compresses the lungs. This leads to the surface to breath, reduction of the CIT. In patients there is shortness of breath, especially when driving. In the recovery period are resorption of exudate. This process is accompanied by the formation of pleural growths (adhesions). Small pleural adhesions do not cause significant disorders of respiration, common - can cause disorders of respiratory and blood circulation, which affects the functional state of the organism and is accompanied by a decline in physical ability to work. All these pathological changes require persistent treatment in order to restore the function of the respiratory apparatus. 4) the General strengthening of an organism and increase of resistibility. The course of medical physical culture is divided into 3 periods: I (gentle), II (functional) and III (training), the duration of which depends on the severity of the disease. The third period runs in conditions of a hospital or sanatorium. 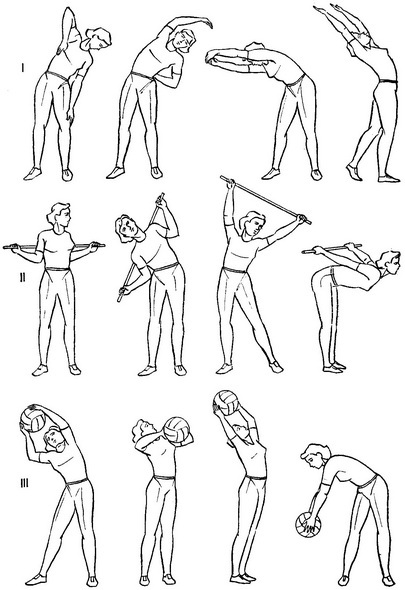 In the first period used simple gymnastic exercises for the upper and lower limbs, combined with breathing exercises and exercises for the body (Fig. 7). The starting position is adjusted depending on the patient's condition. Dosage of exercises: for small muscle groups 6-8 times, for large - 4-6 times. The pace of the exercise slow and average. 5) exercises on the gym wall (vises, polovici). For the greater effect it is expedient to give to the sick of tasks for independent work of special exercises.